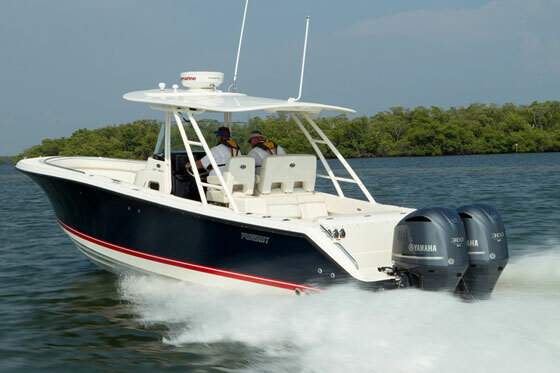 The Pursuit S 328 Sport promises to blend fishing features with social grace. While we’d all love to own a fleet, economic reality limits most of us to a boat or three—which means we need an uber-versatile design, like a center console. True, most people think of center consoles as pure fishing boats, but this just isn’t the reality. In fact, there are many center consoles out there that one wouldn’t dream of defacing with fish blood and smelly bait. 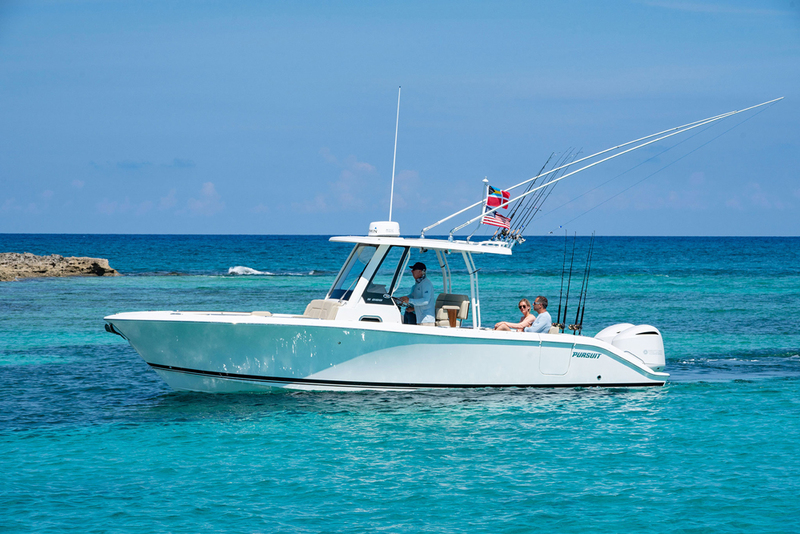 But if you do want to fish, and you also want a boat that offers the amenities provided by a luxury day-boat—plus sporty performance—then you’re looking for a center console that keeps fishability in mind but also offers those perks you’d find on more genteel boats. 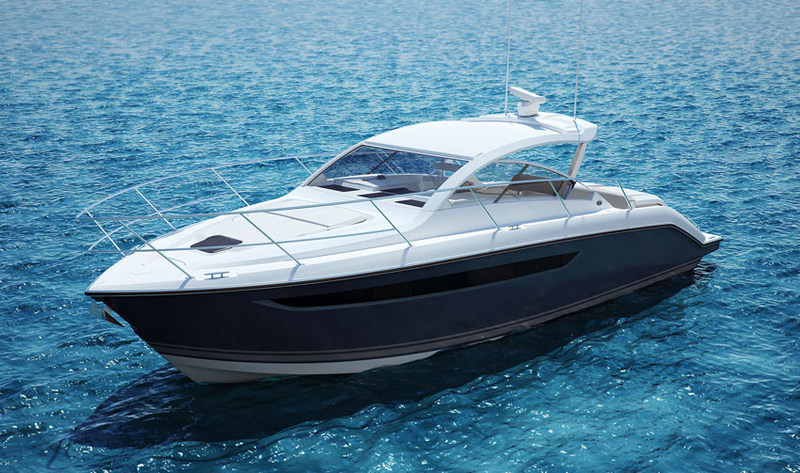 You’re looking for a boat like the Pursuit S 328 Sport. Take a quick look at one, and find out why. Fishing-wise, all of the usual accouterments are present and accounted for. There’s a 24-gallon livewell in the transom, flush-mount rod holders in the gunwales, integrated fishboxes in the deck, rodracks under the gunwales, and both fresh and raw water washdowns. There’s also dedicated rod stowage for four rigs inside the console cabin. Unlike the console cabins on some large center consoles, Pursuit doesn’t blow it out of proportion to make it seem huge inside at the cost of deck space. It has a two-person berth that converts into a small settee, a head, and a sink, and while it is somewhat tight down below, everything you need for weekending is present. Besides, keeping it relatively svelte means there’s more space to enjoy the great outdoors. Space for things like a large bow cockpit, with U-shaped seating forward and a large lounger on the front of the console. What about cooking facilities? There’s no galley down below because there’s no need for one, thanks to the sink, refrigerator, and (optional) grill in the cockpit. 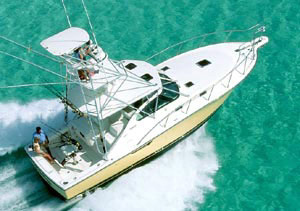 In fact, the cockpit—usually thought of as pure fishing territory on a center console—is designed for maximum entertaining abilities. A double-wide seat flips out of the back of the leaning post, another flips out of the transom, tables sit in the middle, and you can convert the cockpit into a bona fide socializing area in 10 seconds flat. When it’s time for a dip or watersports, note the transom door and extended swim platforms to either side of the outboards. A 30-gallon onboard freshwater system means you can rinse off the salt before climbing back aboard. And note that this freshwater system is a standard feature. On many boats it would be considered a cost-adding option. In fact, that’s true of lots of the things found on the S 328 Sport’s standard feature list. A Bluetooth stereo system with seven speakers, an amplifier, and two remotes? Standard. A three HP bow thruster? It’s on the list. A windlass, stainless-steel through-hull anchor, and chain? Yup, that’s present and accounted for, too. Is the Pursuit S 328 Sport really a fishing boat, or a social platform? Yes! Aside from versatility, the execution of details is where this boat shines. Fit and finish is spectacular, which is no surprise to those of you familiar with Pursuits. 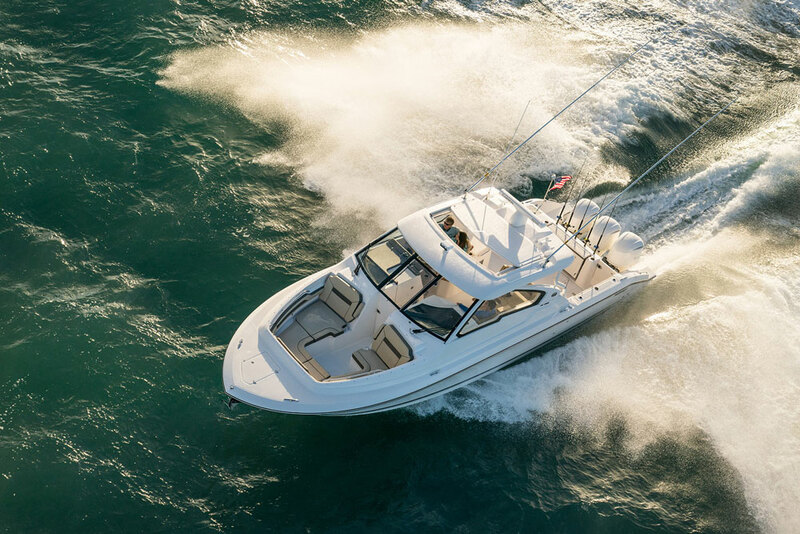 You can pick apart their entire line, from the relatively small C 238 to the chunky OS 385, and you’ll have an exceedingly difficult time finding a single inch of boat that Pursuit hasn’t made silky smooth to the touch and pleasing to the eye. The down-side here is cost, because attention to details takes time and time is money. 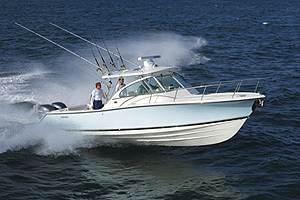 The S 238 Sport listed at a hair over $300,000 at press time (with a pair of 300 HP F300 Yamahas on the transom). That’s not at all cheap, but you get what you pay for. So far as construction goes, again, you’re looking at top-shelf. Pursuit builds this boat with vinylester resins (which aren’t as water-permeable as less-expensive polyester resins), an infused-glass stringer grid, a five-ply infused transom, and 316L-grade stainless-steel all over the place. Flip up a hatch for more confirmation of quality: it’ll be finished on both sides, supported by a gas-assist strut, have latches that dog down tightly, and will be gasketed, guttered, and drained. If you care about fishing and nothing else, will you really want all that seating and the cushy cabin? Nah. If all you’re interested in is cocktail cruises or weekends spent cruising with friends and family will you really care for the livewell and fishboxes? Of course not. 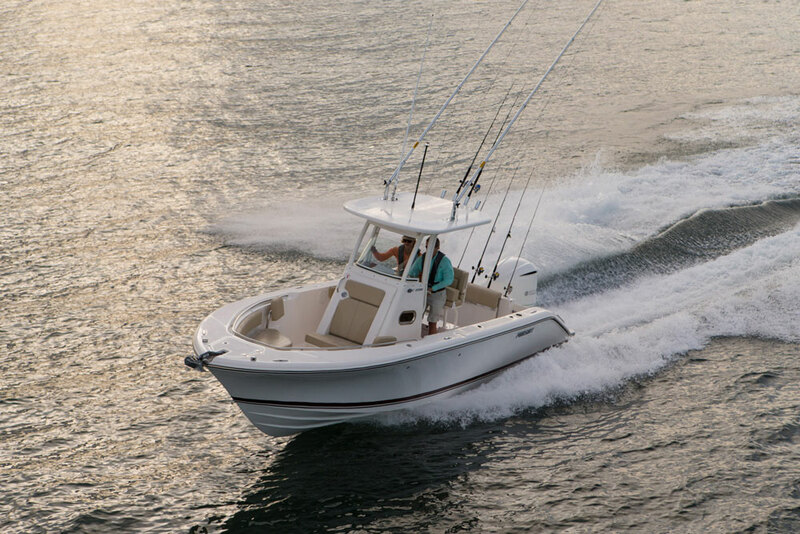 But if you need a boat that can do all of the above, you need the versatility of a center console—a center console like the Pursuit S 328 Sport. 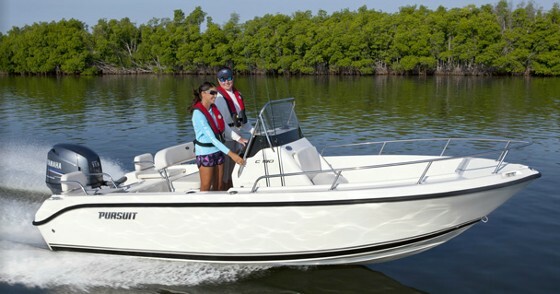 Other Choices: Shoppers interested in this boat may also want to peek at the Boston Whaler 330 Outrage. 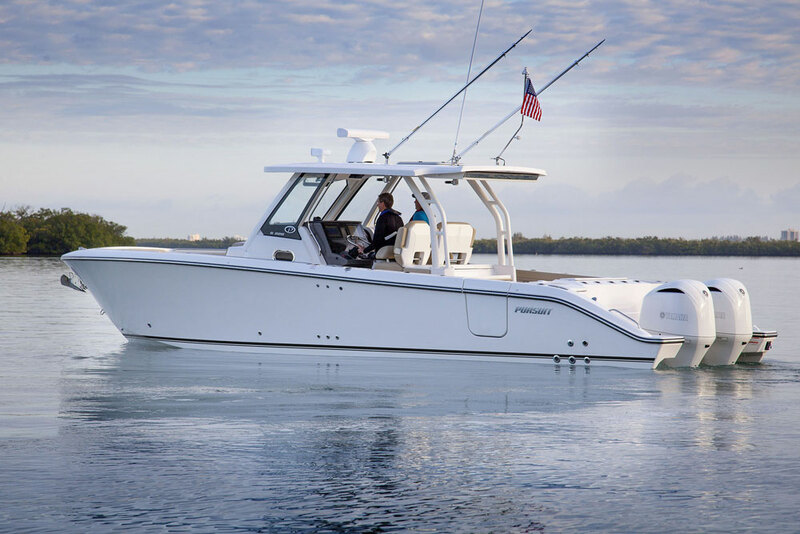 The Scout 320 LXF would be another boat worth checking out. For more information, visit Pursuit.